Tempered crystal console( top thickness mm. 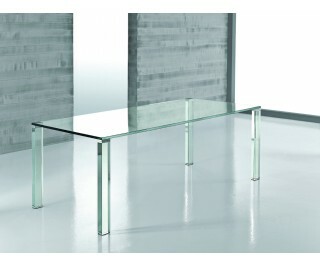 19) with removable legs in glass, wood or thick leather. A patented mechanism allows you to disassemble the legs and to re-assemble them perfectly aligned to the top. Two trestles are furnished; this allows the customer an easier assemblage with no need to apply to skill labor.